A little bit of rain never hurt anybody and it certainly didn’t get in the way of Art Lab last Wednesday evening on Dec. 3. Originally scheduled to take place at their usual spot in the Student Center terrace, the leaky weather resulted in a last-minute venue switch to Pacific Ballroom D and all for the better — the enclosed space made for a cozy, warm and relaxed environment where students could take their time enjoying all Art Lab had to offer. 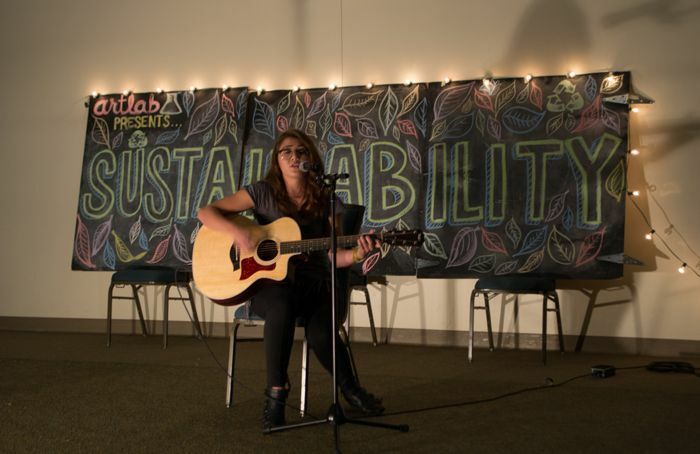 The theme for this particular Art Lab is “Sustainability,” which invited students to express what they think it means to be sustainable through both art and observation. In one corner of the Ballroom was the display for art submissions by UCI students, including a bouquet made of “trash” items like Styrofoam and old newspapers by fourth-year film and media studies major Edna Tobias. 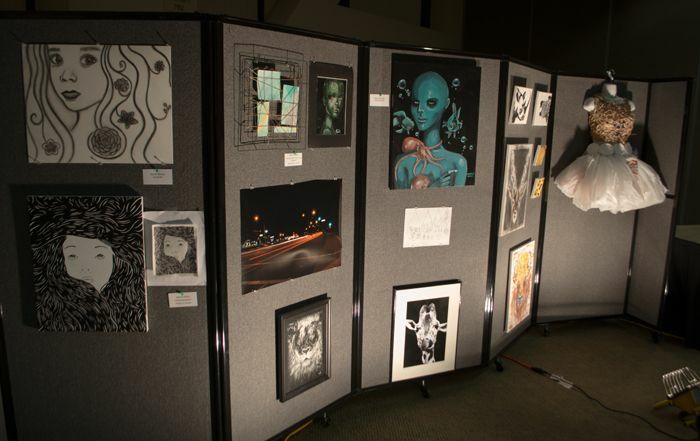 Third-year chemistry major Bryant Bonilla submitted haunting portraits of females with alien-like features that gave a sense of how humans would incorporate themselves with the environment in the future. There was also a station dedicated to the Mural Movement, in which Art Lab invited visitors to sit and paint on squares of canvas. Each piece is going to be sewn together and the mural will be displayed at the next Art Lab and will be continually added to as the events go on. The DIY Club also had a station where students could make sustainable Harry Potter wands out of materials like paper and glue. In the background of all this, live performances went on for the entertainment of all, and made for a great atmosphere. There were acoustic performances by former Soulstice winner Imon Santos and Tracy Ratledge, who did a set of Christmas songs. There were also less conventional performances, like Alejandro Ortiz’ rapping, Steven Grossman’s experimental set and Nikki Kathuria’s inspirational spoken word piece. The surprising hits of the Art Lab live performances were the last two of the night — the heavy rock band Deliverance led by Brandon Lalenti and Jonathan Edzant. Deliverance’s rock instrumental set was the perfect dose of jolting energy after a chilled out night. It provided a great change in the atmosphere and pumped up the crowd despite the later hour. Edzant was scheduled to perform earlier, but conflicts pushed his slot to the very end. It really was saving the best for last, as his versatile voice delivered incredible covers of Billy Joel, Frank Ocean and an impromptu Beyoncé performance at the request of yours truly. Art Lab once again delivered on an inviting atmosphere in which students were allowed an area that both cultivated a sense of community and give a chance to get their creative juices flowing. “I really want to work on permanent spaces for art pieces just to show off how talented our students are,” Van said.